River Reflections. Copyright Laurence Parent 2010. All rights reserved. Despite the beautiful setting, a trip down the Devils River can be challenging to plan, exhausting to navigate, and life-threat­en­ing to the unprepared. Only experienced paddlers should embark on a Devils River trip. You’ll need to bring all supplies with you, as no stores are nearby. Cell phone service is limited on the drive here and un­a­vail­able near/on the river. No public take-out sites are available for private ve­hicles between Baker's Crossing and Lake Amistad. Your only option is to ar­range take-out with a private outfitter or private property owner. Shuttles for Devils River paddle trips average two hours each way, mostly on very rough rock and gravel roads. Paddlers with permits can stay at one of our paddler camps . You must reserve and pay for campsites in advance. Paddler camps are open seven days a week. Only one-night stays are allowed. You’ll also need an advance permit to camp on the Lake Amistad section of the lower Devils River, if you plan to go that far. Contact Amistad National Rec­re­a­tion Area at (830) 775-8779. Camping on islands within the river, while legal, can be extremely dangerous if the river rises. Camping or hiking along the river bank above the gradient boundary is tres­pass­ing, unless you have permission from the landowner. Most of the land along the Devils River is private. Although you may believe you are miles away from the nearest home or another human, you are not. Over the years, landowners have had to deal with tres­pass­ing and other illegal ac­tiv­i­ties such as fires, firewood gathering, and littering. Know that they watch their properties carefully, and will file trespassing charges. Read and print a paddler map, which has critical in­for­ma­tion that every paddler must know before taking a trip on the Devils River. 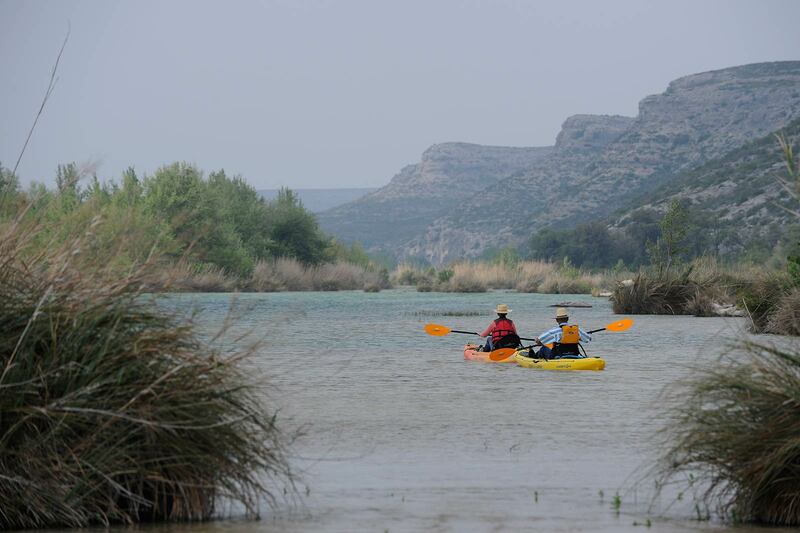 You must have a Devils River Access Permit (DRAP) if you plan to access the Devils River State Natural Area units or paddler camps. A DRAP costs $10, and camping fees also apply. Call (512) 389-8901 to obtain a DRAP and reserve camp­sites. 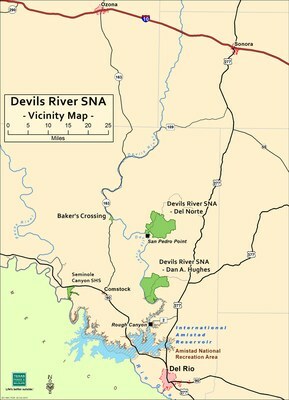 Read an overview of the Devils River Access Permit (PDF 326 KB). Sanitation: Pack out what you bring in. Cat holes are not acceptable on the Devils River. WAG bags are required for human waste. Purchase them online or in most sporting goods sections. Trash: You must remove all trash. Cooking: We recommend containerized fuel camp stoves for cooking while paddle camping. Campfires: Campfires are not allowed along the Devils River State Natural Area waterfront or at any of the TPWD Sanctioned Paddler Camps. 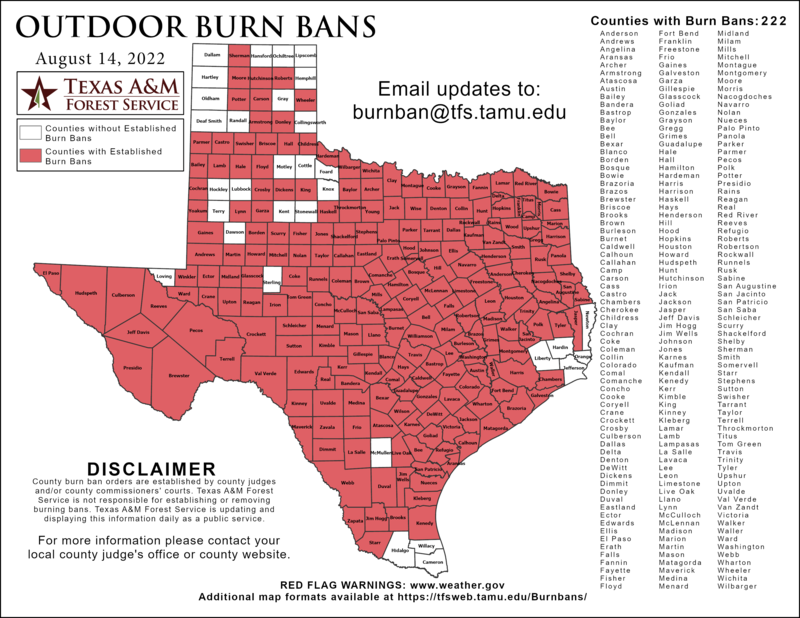 Fires are allowed within the river’s gradient boundary only when Val Verde County is not under a burn ban. The best times to go are spring and fall. Begin each day early to take advantage of daylight! Before going, print a paddler map and review available guides of the Devils River and surrounding area. Secure all loose items (including coolers) in your boat to withstand swamping and rollovers. Use dry bags for trash, to avoid rips that could pollute the river. Everyone plays a role in keeping the river clean. Don't be an irresponsible paddler! Know the con­di­tions be­fore you go. The Devils River can flash flood and become dangerous very quickly. Check the latest weather forecast and water levels before going on your trip. Low water levels may cause canoes and kayaks to drag. You may need to portage around shallow waters. Strong southern head­winds can make for an exhausting trip. Extremely high or low temperatures can occur unexpectedly. This unit is only open from Friday at 8 a.m. to Monday at 5 p.m. The parking area is .9 miles from the river. Make prior ar­range­ments with an outfitter if you can’t carry your gear that far. You must arrange take-out at the Dan A. Hughes Unit in advance with a TPWD-approved outfitter. 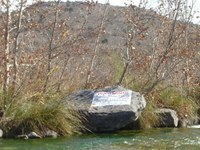 Warning sign on river left before Dolan Falls. The river offers a mix of slow-mov­ing pools and brief Class I to Class II rapids. Several other rapids could be considered Class III when water levels are high. Hazardous conditions may exist anywhere along the river. The movement of water has created an uneven limestone riverbed. This, combined with submerged boulders, often leads to leg injuries. This same limestone is very abrasive and will quickly wear a hole in a boat. Most major mishaps occur at the three rapids listed below, but expect to en­coun­ter other difficulties created by tight channels, shallow fast rapids, strong headwinds and river cane. Changing water levels will affect all river conditions. Portage is not necessary, but consider it as boats are often damaged beyond repair here. Position your boat on the left side of the main chute to move through the four-foot drop. Beware of low-hanging trees on river right, below the rapid. Loitering above this rapid on private property longer than the time it takes to actively scout and portage can lead to trespassing charges. We strongly rec­om­mend that you por­tage around Dolan Falls, a 10-foot Class IV waterfall about 16.4 miles downstream from Baker's Crossing. Look for the large warning sign posted on a boulder on river left as you ap­proach. Take out early above the falls, and portage on river left or right. The river banks surrounding the falls are private property. Don’t loiter there more than the time it takes to actively scout and portage the falls, or you will be trespassing. Injury and loss of equipment are common when paddlers attempt to run Dolan Falls. This Class II to III waterfall, also known as the Cascades, is about 20.4 miles below the put-in at Baker's Crossing. It requires careful negotiation. Scout prior to running if possible, and approach from river right. The spring-fed Devils River is one of the most pristine rivers in the state. It is well-known for its exceptional water clarity. Learn more on our Nature page. Paddlers have never reported any animal attacks, nor have they reported needing a firearm to defend themselves from an animal attack. The following outfitters provide shuttle and guide services for paddling and fishing trips that launch and/or take out on the Devils River State Natural Area units. 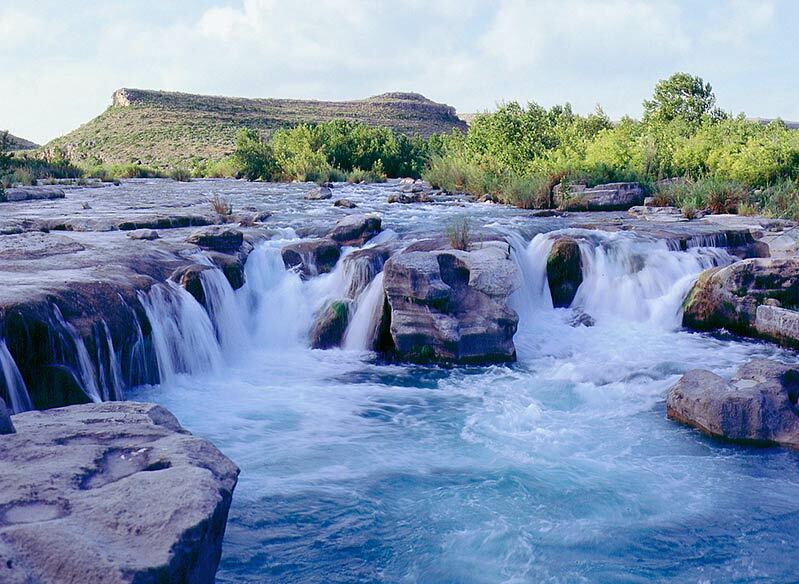 River flow gauges: Scroll over Devils River gauges to see flow rate details.